Not every mission to space centers on improving humanity’s understanding of the universe. Sometimes, the top priority is simply turkey. It took two tries, but on Saturday, a SpaceX Dragon capsule docked with the International Space Station (ISS), the lab currently orbiting 254 miles above the Earth. In addition to carrying plenty of the usual cargo suspects — mice and worms for experiments, two-and-a-half tons of science equipment — the craft also brought with it a holiday feast fit for a crew of hard-working astronauts. 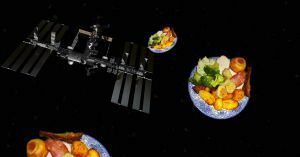 According to AP News, the ISS Christmas dinner consists of smoked turkey, green bean casserole, candied yams, and cranberry sauce. No word on the current state of this food, but past holiday meals aboard the ISS have consisted of similar treats served out of cylindrical tubes and hand-held packets. As for dessert, the astronauts can enjoy fruitcake (as much as anyone can enjoy fruitcake) and two types of cookies (shortbread and butter) which they can decorate themselves using tubes of icing. Fingers crossed NASA livestreams the microgravity decorating process. Only three of the six astronauts currently aboard the ISS will still be there on December 25 — the other three will spend the holiday back on Earth. No word on whether the remaining crew will actually wait until Christmas to enjoy their feast or dive in right away — but if anyone has the self-discipline to not eat any and all Christmas goodies the minute they’re within arm’s reach, it’s probably an ISS astronaut.